If you live in Bangladesh, in Dhaka City, and you have got an apartment or building or house and have a electric meter from Dhaka Electric Supply company (DESCO) , then you can view your monthly bill from Online without any registration/ sign up. Step 2. 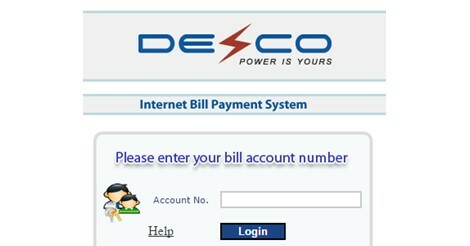 Enter your DESCO Bill Account number and press login . You will get the Account number from your DESCO Bill paper hardcopy. Step 3. Go to "View Bill". Dhaka Electric Supply Company Limited (DESCO) is a public limited company which distributes electricity in Dhaka. It was established on 1996. Its head office is in Nikunja-2, Dhaka, Bangladesh. In 2010, it has launched online bill payment system. In 2012, it started online application for new connection of electric meter.